My love for all things Pattydoo continues. 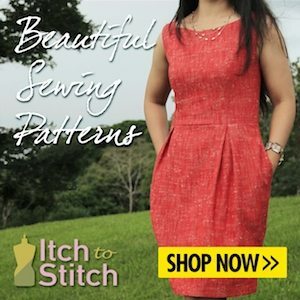 Not only do they have a super range of sewing patterns, some written in English and some in German only, but they also have some great free patterns and this is one of them! Fortunately this is one of the patterns that you can print out in English too, so it’s a winner all round. 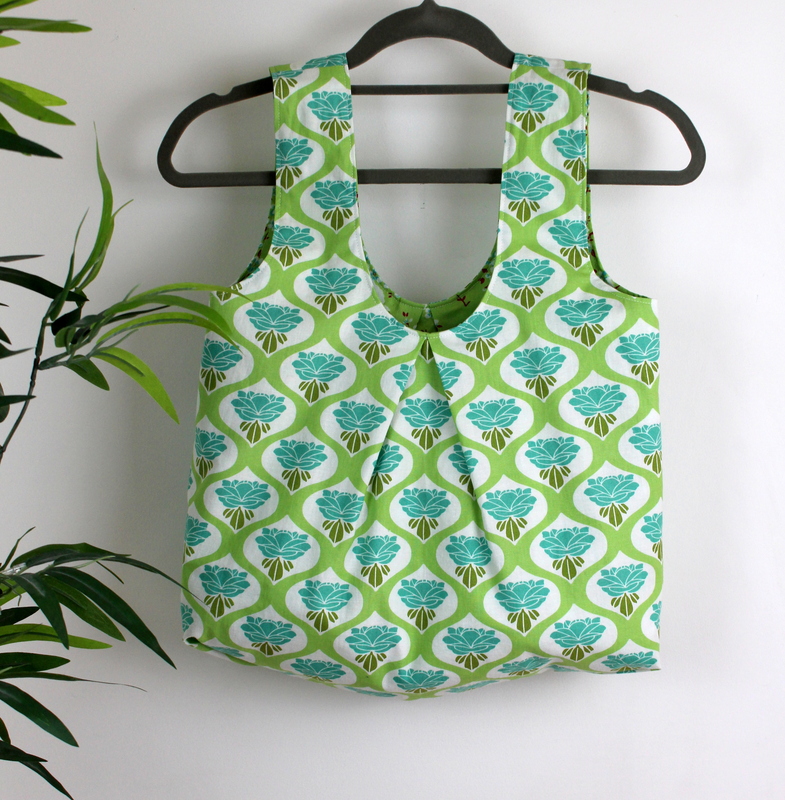 So, this free pattern is for a reversible grocery bag. It is available in a small (children’s) size, and a larger adult sized version and you can choose to make it with webbing handles or fabric throughout, as I did. Because it is reversible, it is effectively lined so this makes it nice and strong too. I’ve been on the lookout for a pretty shopping bag for a while, and wanted something different to a regular tote bag. I wanted a bag that I could carry in my hands or in the crook of my elbow (not a shoulder bag) rather like a regular 5p plastic carrier bag, and I also wanted it to be reasonably sized so that I could fill it with plenty of shopping. I was totally taken with the shape of this bag, in particular the pleats, and I knew that I had some pretty quilting cotton in my stash that I had been saving for a project like this. I could tell from the images that I had seen on the internet that the handles were going to be a little bit too long for the style that I was after, so I shortened them by 7cm. As mentioned before I wanted it to be ‘carrier bag style’. I simply printed out the pattern, cut it out and shortened the handle by 7cm before cutting it out. The width of my fabric was quite narrow, and I didn’t follow the cutting layout that Pattydoo had suggested. I folded both my selvedge’s into the centre to give myself two folded edges, and jiggled the pieces to make it fit. It worked out fine though and I managed to get each bag cut out with no problems. Take care if you have a directional print to make sure that your pieces are laying in the correct direction before you cut it out. Along with the inverted pleats which I think are so cute, I love the way the boxed corners are sewn. I think they’re really pretty and give an interesting finished result. There are no written instructions to make up this bag included in the PDF, instead you are directed to a great Video tutorial which takes you through the whole step-by-step process of making it. Although this is spoken in German (I don’t speak German), it is really good and clear and is a great way to follow along with the sewing process. The fabric that I have used is a quilting cotton from a range by Tanya Whelan. It was purchased from a small independent fabric shop which is no longer in business, but I will leave a link here for one alternative source of this fabric from this range that I have found. It also gives you a good idea of the coordinating colours and designs available in this collection. I really recommend quilting cotton or something of similar weight/strength for this project as the finished result is a really strong and sturdy bag. It’s a quick sewing project, and I am so happy with how it turned out. I am definitely keeping this for myself, but it would make a great gift idea too I think. I have a little fabric left over and when I get a chance will make a small pouch to keep it tidy inside my handbag so that I have it with me at all times. Our jute bags are on their last legs and I would like to make a set of bags like this using upholstery fabric probably and webbing handles, but cannot seem to find a good sewing pattern (it doesn’t have to be free) that looks similar to this design. If anybody has any good pattern suggestions for something like this, I would love it if you could leave a comment below and I can check it out. Thank you so much! Let me know if you have a go at the Pattydoo pattern, I would love to see your makes! Previous post: Another Pattydoo Chloe Dress. Purl Soho have a good 40 minute tote pattern (free) – not quite the same shape, but it is a nice useful bag. Thank you for your posts which I always enjoy reading – your sewing skills are amazing and one day I will take the plunge into garment sewing. This looks great! I’ll definitely have a look at the pattern as your version is lovely and bags are always useful. Wow, this is so beautiful. You’re so creative. I’d love to make something like this – thanks for sharing.